It’s hard to know where to begin writing about my just-concluded nine-day visit to the Arizona/Sonora borderlands. I went with nine other women connected to Shoreline Indivisible, which has a very active immigrant rights component. I was with them most of the time, as Robin and Susan had already been to Arizona a few months previous and set up most of our excellent itinerary; and I was on my own some of the time, mostly doing interviews for some stories I’m filing. My Spanish came in very handy, both in volunteering at a shelter in Tucson and for speaking with migrants in Nogales, Sonora. 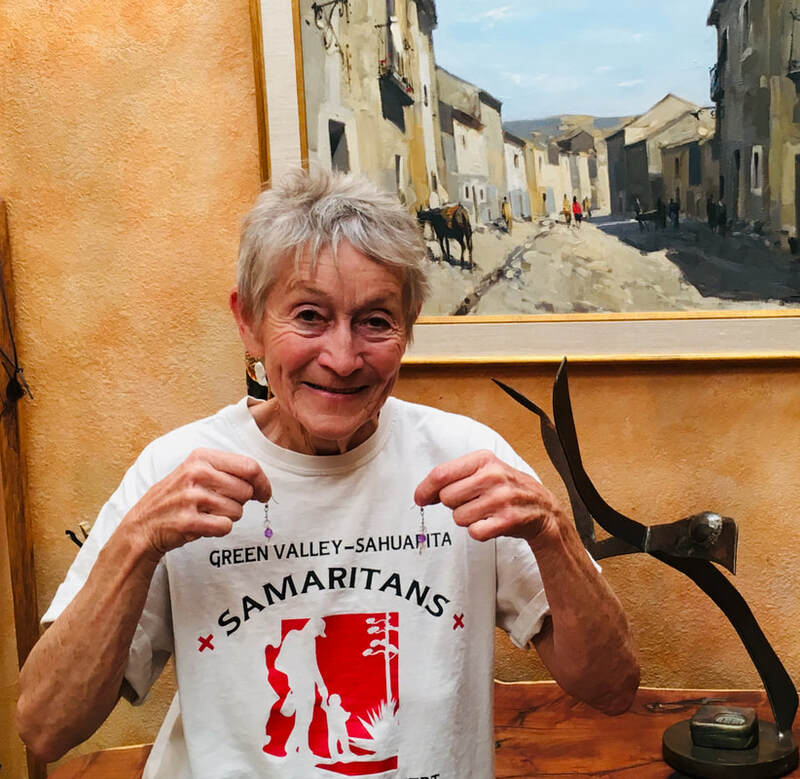 We worked with several members of the Samaritans group, made up almost exclusively of retirees who drive through the desert looking for anyone who might need help and who also walk various distances to place plastic jugs of water, snack food and socks at locations along migrant routes. Since 2001, more than 2,500 bodies have been recovered from the Tucson Sector, which covers 262 miles of the border. Think about that. No one knows how many more have died and never been found. One thing became clear: many fewer people are trying to evade Border Patrol and cross through the desert to the U.S. side and many more are coming with their children and presenting themselves to authorities, seeking asylum. Trump keeps pursuing more and more extreme avenues to keep people out. He even threatened to completely close down the whole southern border while we were there. We experienced a whole volunteer-run, bi-national series of operations to help the migrants with food, shelter and medical care, who are fleeing the most horrific circumstances: the cartels seems to control everything, and they demand regular extortion payments from folks just trying to sustain small businesses and support their families; when people can no longer pay, the threats follow, and then the loss of everything, and sometimes murder. There was a recent story in the NY Times about the gruesome murders of Honduran women in particular, which is its own unique nightmare. Then there is the climate-related disaster – the ongoing drought in the “Dry Corridor” of Guatemala, Honduras and El Salvador – which has destroyed cash crops like coffee as well as subsidence crops like beans, corn and tomatoes. Several Guatemalan men I was chatting with in the Monastery, the shelter in Tucson, all told me there was no work and no way to grow food for their families, which led them to flee. “Climate change” is not included among the official reasons that allow asylum, but it obviously should be. The U.S., through its greenhouse gas emissions, is directly responsible for much of the desertification south of the border. On our first day we went with Shura, a 77-year-old Samaritan volunteer, through the DeConcini gate into Nogales. She’s been doing this work since 2001, and it honestly seemed like she knew all the migrants on the street, all of whom she greeted with hugs and kisses. (In the photo above Shura is holding earrings made and gifted to her by a young migrant boy.) We entered a tiny room with a blanket hung over the door opening to find about 20 migrants inside, sitting on thin mattresses in family groups. They had come from shelters in Nogales and were awaiting their turn to cross the border and apply for asylum. Right after we returned home a federal judge in California ruled that the U.S. can’t force asylum seekers to wait in Mexico, but a three-judge panel of the Ninth Circuit Court of Appeals ruled in Trump's favor. More litigation will follow. Then we visited el Comedor, a feeding program run by the Jesuit Kino Border Initiative. They feed both people who have been deported from the U.S. as well as those still hoping to get in. 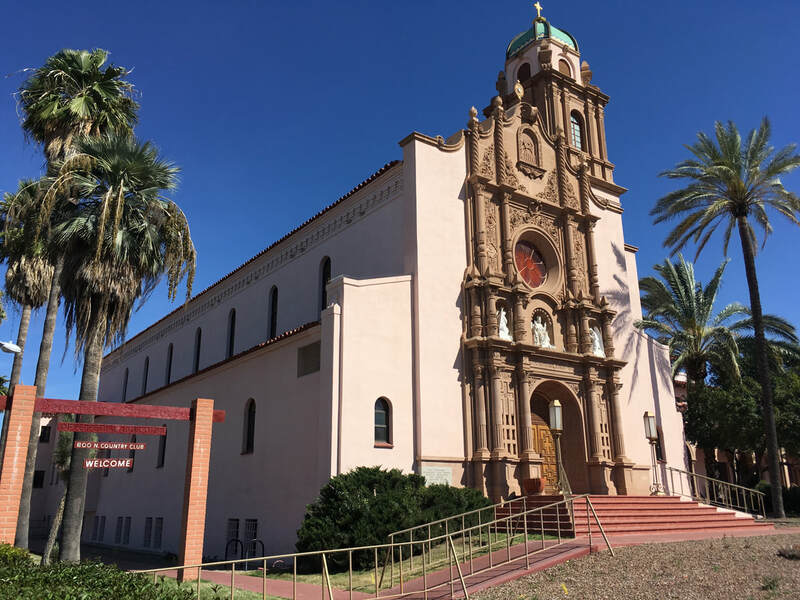 On the U.S. side, we volunteered for a few days at a beautiful former Benedictine Monastery in Tucson that’s being used temporarily as a shelter by up to 300 people at a time. (See photo below.) The volunteers offer food, cots, clothing, medical care, toys and help arranging for their transportation to the migrants’ sponsors around the country – as well as love and respect. Click here to read or listen to an interview I did with the site manager for Between the Lines, and here for my Forest & Trees show featuring many voices. (Note: my show starts 35 seconds in.) Many of the migrants had been bused over from El Paso – Ground Zero for the influx of people fleeing their home countries – where they were forced to sleep on rocks under a bridge, exposed to the elements with just an aluminum “space blanket.” I actually saw one and was dismayed to learn it’s thinner than a piece of aluminum foil. Many of the young kids were sick, and I also met a dad who had a terrible sore throat and other respiratory symptoms. I asked if his young daughter had gotten sick, and he said, “No, because I cradled her in my arms.” For some reason that really got to me. These were all people who had passed a credible fear hearing, demonstrating to immigration officials their fear of returning to their home countries. I learned from an immigration attorney that 90 percent or more of those who apply for asylum pass this first stage, but that very few actually gain asylum, since the allowable reasons keep shrinking under Trump (e.g., his administration has ruled that violence, including domestic violence, is not a valid reason). There seem to be as many dads with kids here as moms, including many very young women who are nursing babies. These were the lucky ones who did not have their infants ripped from their breasts and separated from them. There are also intact families of mom, dad, and two or three children. It’s inspiring to see what volunteers can put together in very short order to care for those in need. It’s the total opposite of how the U.S. government operates. More border stories to come. I still like having birthdays. Mine falls the day before the vernal equinox, the official start of spring. I loved hearing from several of my long-time friends, and more recent ones. too. Also heard from all the birds singing. I had a good start to the day at the gym. Then I went to Hartford to support an immigrant who was having an asylum hearing. There were about a dozen of us there, in the waiting room, and then the judge called us into court and said he took note that she had a lot of community support. Mike, one of the regular advocates, said this judge is the best one could hope for, that he actually seems fair and compassionate. I was impressed but immediately thought that he’s propping up a rotten system. Mike told me a story of a prosecutor who attended a talk about immigrants’ rights at the prosecutor’s church, and it was clear that he was sympathetic. Mike said even if the system is rotten, it’s better to have compassionate people in those positions than not. In the evening I went to a screening of the HBO documentary, Say Her Name: The Life and Death of Sandra Bland. It was incredibly powerful, including cell phone video of her encounter with the cop who stopped her, interviews with the Texas district attorney and the sheriff in the lock-up where she died, intimate interviews with her family, and clips of her own YouTube posts called Sandy Speaks, where she talked about fighting police brutality, why Black Lives Matter, and the need for both black and white people to have more friends of the other race. Her sister, Sharon Cooper, who was prominently featured in the film, was on a panel afterward, along with two local community organizers, the head of the ACLU of CT and a New Haven cop in charge of Internal Affairs, who explained some NHPD procedures. Sharon said she really appreciated his participation and that it highlighted the importance of not generalizing that all cops are the enemy – although one of the local panelists said her goal was to abolish all police departments, as they had their beginnings in slave patrols and still mostly serve that purpose today, targeting African Americans. One of the panelists called for the white people in the audience to go beyond being supporters to being co-conspirators, to face with them what they have to face in our racist society, and change it. I plead guilty to being too quick to pigeonhole people and write them off, when it would be more productive to engage them, unless they’re hopeless like Trump and his ilk. 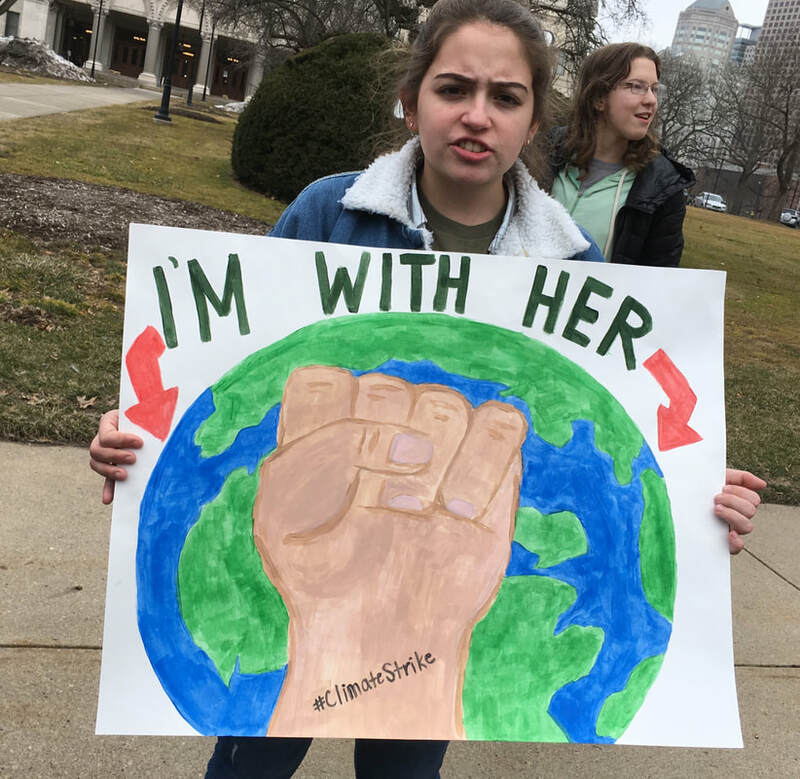 On March 15 I went to the Connecticut Youth Climate Strike in Hartford, organized by teens and attended by some adults as well. It was part of a global youth climate strike inspired by Swedish phenom Greta Thunberg. The rally was, not surprisingly, extremely energetic and fun, though the message was somber. I’ve noticed that young people tend to mention the dangerous impacts on other species, including extinction, more than adults, which to me bespeaks a greater biophilia. Afterward some right-wingers claimed the kids were manipulated by adults with their own “agenda.” I don’t know if they really believed that, but to hear the young people refute it was just more proof of how well-informed and well-organized they are. The photo above is from the event. Around midnight I went outside to walk under the full moon. I always think that after humans (some disastrously way more than others) have wrecked our beautiful planet, the moon will still rise and fall, and shine, and it gives me a perhaps strange sense of peace. Despite the current horrors brought to us by the climate crisis, I do think I spy a light at the end of a very long tunnel. Or for another cliché, it’s more like a hundred flowers blooming. In the U.S. young people – though significantly older than the young European activists – founded the Sunrise Movement after the 2016 election and were laser-focused on the 2018 mid-term elections, where they helped turn the U.S. House blue and bring some climate hawks into office. They’re promoting a Green New Deal, and, while several groups have critiqued it from the left – saying it doesn’t call specifically for phasing out fossil fuels or exclude nuclear power from the “carbon-neutral” goal or call for a cut in Pentagon spending to fund it – it has put the climate crisis at the center of public attention. I went to DC over the weekend to support hundreds of Sunrise activists, and especially a group from Kentucky, who went to Mitch McConnell’s office to “look us in the eyes and tell us your $1.9 million donation from the fossil fuel industry is more important than our future.” More than 40 of them were arrested when they refused to leave his office. And he didn’t meet with them – just like he didn’t meet with them over a Congressional break when he was supposed to be in his district. They went to his district office for three days in a row, then spent a night outside his office in the rain to show their commitment. The goal of the DC action was to show he can’t stop their momentum by calling for a premature vote in the Senate on the Green New Deal resolution. (They say it’s premature because they need more time to convince more lawmakers to support it.) They were incredibly high-energy, passionate and emotional as they talked about their doomed future if people in power don’t take emergency action. You can see Erin from Kentucky leading the song, “Which Side Are You On?” at the training before the action. That’s a classic protest song, but the Kentuckians pointed out that it was written by a coal miner’s wife from Kentucky about a century ago. I was so happy to spend time with these young people, who ranged from 17 to their mid-20s. I highly encourage anyone over 30 (not to mention over 70) to engage with them whenever possible to learn their perspective. There’s other good news. The federal Tennessee Valley Authority (TVA) – with a majority of Trump appointees – just announced it’s closing two coal plants because they couldn’t compete economically with other energy sources, despite personal lobbying from both Trump and Mitch McConnell, in whose state one of them is located. The Sierra Club reports that 47 coal plants have announced their retirement or have closed since Trump took office. I also just attended the annual winter conference of the CT chapter of NOFA, the Northeast Organic Farming Association. There were several workshops on agriculture and climate change, and no-till, regenerative farming and gardening is gaining enthusiastic adherents. Normal tilling releases tons of carbon into the atmosphere, so the less we do that, the better off we are. I’ve often felt that energy efficiency is the poor step-child of the clean energy movement, but I attended a conference today that focused on it front and center. Usually we hear about renewables – solar and wind and whatever else fits into one’s definition of “renewable” – but the cheapest, cleanest energy is the energy that’s never consumed, through efficiencies. This event was sponsored by Efficiency for All, an outreach and advocacy group founded by a powerhouse Latina woman named Leticia Colon de Mejias. 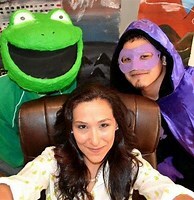 She also runs an energy conservation and insulation business and a youth education project called Green Eco Warriors. She said equity is an essential element of sustainability. What does that look like? Well, much of the energy our state uses goes into heating and cooling our homes and providing electricity for an ever-growing number of necessities and all the non-essentials we don’t need but want. And lower-income folks are the most likely to live in energy-leaking homes. If they can be tightened up to stop those leaks, residents will be more comfortable and healthier and save money at the same time. Those leaks generate in-home pollution and contribute to greenhouse gases escaping into the environment. Leticia made a great analogy. She said efficiency and renewables are like rice and beans – each is nutritious alone but they are tastier and even more nutritious together. The rice is energy efficiency, and you can vary the kinds of beans and the seasoning as you wish – adding different amounts of different kinds of renewables, or even a little gas or nuclear or heating oil if that’s what you have – just so everyone has a plate (i.e., energy to meet their needs). She emphasized that not all “beans” are created equal, and that we need to move to renewables as soon as possible. She also said, as worthy as electric cars and EV charging stations are for reducing carbon emissions, they are not the priority for low-income residents, who can’t afford them and who benefit more from clean air inside their homes and around their neighborhoods. In fiscal years 2018-2019 the Connecticut General Assembly raided the energy efficiency monies that electric customers pay each month on their bill – which is meant for the express purpose of increasing efficiency – in order to help balance the state budget. The total amount of funds diverted over two years from the Connecticut Energy Efficiency Fund, the Connecticut Green Bank and the Regional Greenhouse Gas Initiative was a whopping $165 million. Energy efficiency work generates more than 34,000 jobs in the state, and after the raid on the funds, the number of buildings that were retrofitted plummeted 19% from 2017 to 2018 – when the number needs to soar instead – and many workers lost their jobs. Aside from the seeming illegality of the raid, it was extremely short-sighted, since research has shown that each dollar put into efficiency returns $7 in savings. Leticia was part of a lawsuit joined by several environmental groups that sued the state to try to recover the funds. They lost in federal district court when the judge ruled that the statement on our electricity bills about what the money is for could not be considered a “contract.” The case is being appealed. Meanwhile, the 2019 legislative session began on January 9, and the environmental community is unified that returning the raided funds – and ensuring that they are never raided again – is a top priority. With some new “green” legislators in office, and some veteran lawmakers also on board, I hope the big Democrat majorities in both houses will pass it and our new Democratic governor will sign it. He’s said some positive things about the need to address climate change and more people are pushing for that every day. The Sunrise Movement, an organization of young people that made its debut after the 2016 election, helped elect several new pro-climate action members of Congress this year and has been raising hell in D.C. since the election, sitting in (and getting arrested) in Nancy Pelosi’s office and visiting the offices of dozens of other Congressmembers – a thousand-strong – to demand that they support a Select Committee for a Green New Deal that would treat the climate crisis as the emergency it is, and includes a jobs creation piece that would provide employment in the clean energy sector for anyone wanting a job. They’re calling for the kind of super-fast transformation that happened in World War II, when in less than a year, for example, all the auto companies were making nothing but tanks. As a mostly retired journalist and a climate activist, I had my own moving encounter with this cohort in New Haven this week, when I joined four dozen Yale students in occupying the lobby of the building where the Yale investments office traffics in fossil fuels and Puerto Rican debt. The students’ demands were that the university divest from its holdings in at least $678 million in fossil fuel stocks and cancel the holdings that some of its fund managers have in Puerto Rican debt, since the island – a territory of the U.S. – was forced into bankruptcy inn 2016. The students are demanding that the Puerto Rican people – not wealthy investors – be first in line to get the resources they need to rebuild their shattered island after Hurricane Maria hit in September 2017. We sat in for five hours, and the students had a five-hour “lesson plan.” Four students did a teach-in about the colonial status of Puerto Rico and the resulting horrors. For example, about a third of the island’s women of child-bearing age were sterilized without their consent between the 1930s and the 1970s, and many were used as guinea pigs by pharmaceutical companies developing their birth control pills. Another student talked about her senior thesis on the history of Yale’s now-$29 billion endowment. There was a Skype chat with Bill McKibben, co-founder of the global climate movement 350.org and the guru of fossil fuel divestment. There was a guided meditation and a time to stretch and dance (we were sitting on the floor, and it got uncomfortable after awhile, at least for me). There were beautiful songs and energetic chants, and toward the end the organizers spread out a 30-foot roll of paper on which we were asked to draw something we’ll miss as a result of climate catastrophe and something we will hold dear going forward, which we shared with a partner. At 5 p.m., Yale police announced the building was closed and we were being charged with trespassing. As each pair (the organizers had buddied us up) stepped up to get processed and receive our $92 citation, everyone sang, “Courage [their name], you do not walk alone. 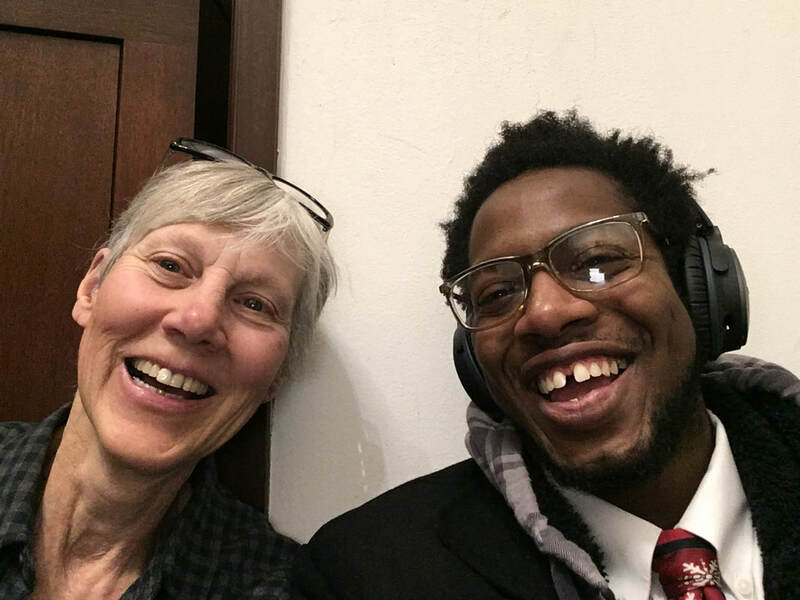 We will walk with you and sing your spirit home.” My arrest buddy was Justin Farmer, a student at Southern Connecticut State University, a Hamden town council member, and a person who shows up when it counts (our selfie above). When we walked out the door, we were greeted with wild cheers by a hundred people who had attended a rally that began at 3:30 p.m. and waited in the cold for us all to be released around 6 p.m. These young people know what they’re up against, and they talk about the stress and the fear and the anger they feel. But I’ve never met a group more full of love and joy. I honestly don’t know how they do it, but I sure was happy to be in close proximity to that for an afternoon. Is this the light at the end of the Climate Denial/Go Slow mindset? In light of the never-ending climate change-fueled disasters, including the most powerful hurricane to ever hit the Florida Gulf coast and the Camp Fire that killed a record 80-plus people and counting and destroyed the whole town of Paradise (both “campfire” and “paradise” will never have the same meanings); and in light of two recent reports – one from the Intergovernmental Panel on Climate Change and one from the U.S. federal government – that say climate change is fully here, having a huge impact on people’s lives, especially the poorest and most vulnerable, and likely to reduce the economy of the U.S. by ten percent by 2100 unless we take drastic action immediately; and in light of this year’s mid-term elections, which brought some passionate young climate activists to Congress talking about a Green New Deal – because of all that, concerned groups and individuals have been ramping up their climate action. One event was a 14-day water-only fast, called Climate Fast NJ, in front of the state office building in Trenton, NJ, calling on Democratic Gov. Phil Murphy not to approve any new fossil fuel infrastructure in the state, including pipelines, compressor stations and power plants. The governor has taken steps to increase the state’s production of renewable energy, and has brought New Jersey back into the Regional Greenhouse Gas Initiative, a cap and trade system that puts a price on carbon that generates investments in clean energy and energy efficiency, but the fasters say these efforts are being undermined by the state’s continued reliance on fracked gas. Two men fasted the full 14 days, while many others joined in solidarity for shorter periods. They got the attention of top state officials, who promised to hold a meeting with them after the Thanksgiving holiday to discuss their concerns. Please call Gov. Murphy at 609-292-6000 or (toll-free) 877-814-5667 to reinforce the fasters' request. Pictured above are Ted Glick and a Ramapough Lenape man, Owl, who both fasted the full 14 days, joined by many others who fasted for a shorter time. They were breaking their fast with a cup of fruit juice. I hate fasting, but I joined for a day-plus because I wanted to support them. I work with Ted in Beyond Extreme Energy, which conducted an 18-day water-only fast in front of the Federal Energy Regulatory Commission in 2015 with similar demands. As Ted pointed out, the demands have not been met yet, so one could say the fasts have been a failure, but he also says he believes it’s a good way to reach people’s hearts who may respond down the road. There have also been a number of victories lately, including such significant court rulings and delays to both the Keystone XL pipeline and the Atlantic Coast pipeline that it’s not unreasonable to think both may never be built, and who knows what all went into those decisions? I was in Trenton for the closing ceremony, which was very moving. 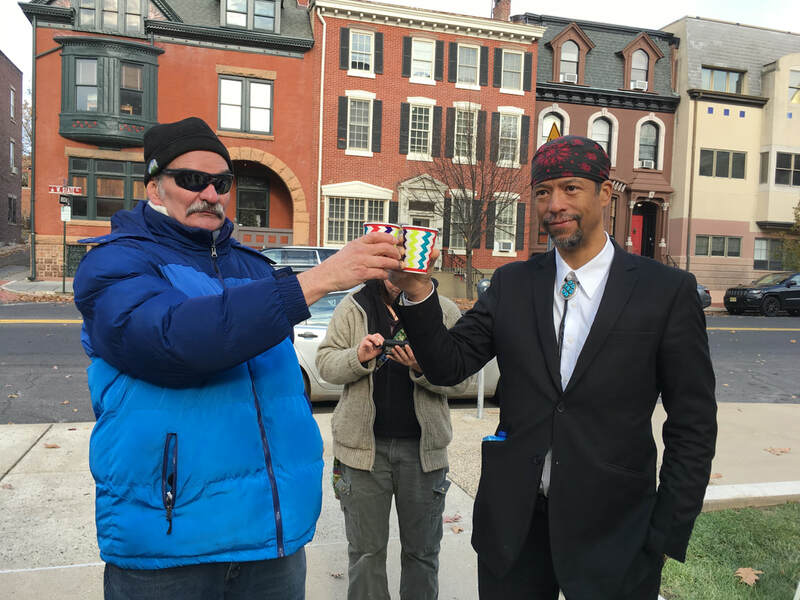 You can hear excerpts from the chief of the Ramapough Lenape, whose historic lands have been targeted by pipeline companies, and several other speakers in this Between the Lines segment. I was feeling pretty optimistic about our clean up of tornado damage at Sleeping Giant State Park (see my previous blog post); that is, until this past Sunday when we worked along the Purple Trail that runs by the Mill River. It was the worst damage I’ve seen so far – tree trunk after massive tree trunk lying across the trail, plus a huge jumble of more downed trees in a nearby ravine. What a mess! If it hadn’t been for the river, I’d have had no idea where I was. We’ll be working until the weather turn too cold and/or snowy to be out there. And working there has highlighted a referendum that will hopefully be approved by Connecticut voters on election day, November 6 – to change the state constitution to provide more protection for public lands, so they can’t be sold or given or traded away by government entities without a public hearing, which can happen under current law, even though in most cases there is public input. The General Assembly would also have to vote by a two-thirds majority on any land transfers. The public lands include state forests and state parks (like Sleeping Giant). Please vote Yes. With so many trees dying in storms, from disease, from impingement by roads and sidewalks, and from the electric utilities’ chain saws (see an op-ed I wrote about that here) – and with so few new ones getting planted – we are fast losing our tree canopy and all the benefits it provides. And Drawdown, a book to which dozens of climate scientists contributed, ranks forests at #12 out of 100 best ways to draw carbon out of the atmosphere. 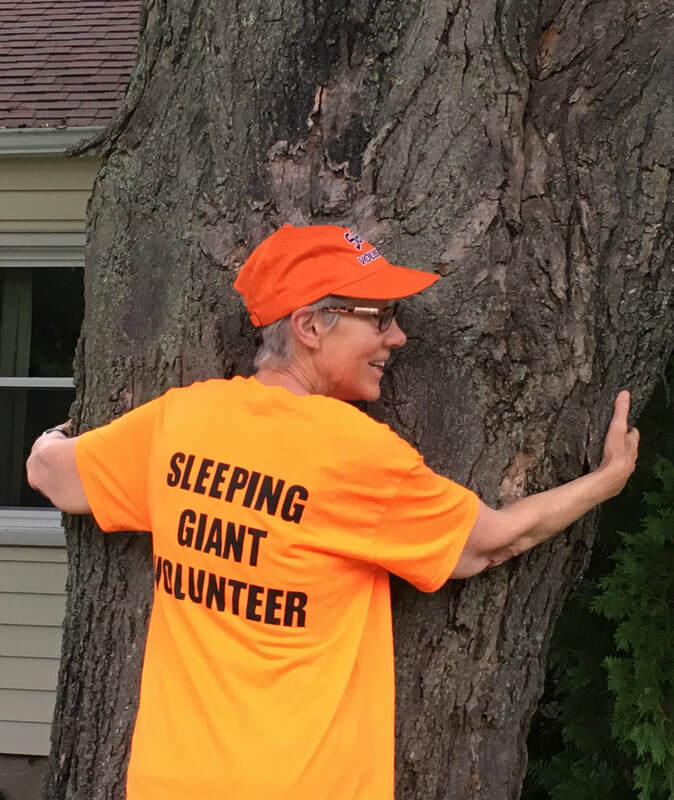 Tornadoes swept through my town in mid-May, wreaking havoc on many neighborhoods and decimating the trees in Sleeping Giant State Park, our go-to hiking venue for 30 years. Thousands of trees came down, making me treasure even more the joys and benefits they impart: beauty, shade, a home for critters, and their role in mitigating climate change by absorbing CO2, to name just a few. So far this year Connecticut has experienced an unprecedented eight tornadoes, fueled, experts say, by climate change. The state closed the park and allowed only state employees or contractors in. It’s beloved by many, and we all wanted to help clean up the mess and get the park reopened. 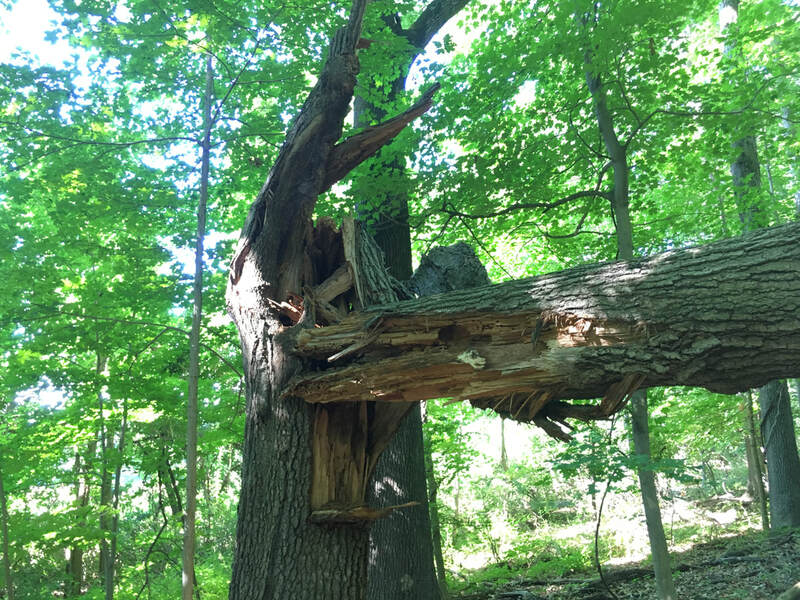 After a month, the Department of Energy and Environmental Protection relented, saying the Sleeping Giant Park Association (SGPA) – which has been doing regular maintenance there for decades – could go in provided everyone using a chain saw passed a two-day class. So starting mid-June, volunteers have flooded into the park every Sunday morning. I am one of them. Some – especially the sawyers – go just about every week. Others of us go whenever we can. We build teams around the sawyers – usually six teams with from three to five members. Our coordinator, Ray, sends out the schedule every week of who’s going where. The front of the park was completely stripped of trees, including the parking area and the popular shaded picnic grounds. It’s unrecognizable. In exchange for cleaning up, contractors took out all the valuable wood; then the area was graded and now looks more like a desert than a forest. There are no immediate plans to replant. The state was responsible for cleaning up the front and the Tower Trail, the most popular, easiest trail to a stone tower with views in all directions to several towns away and Long Island Sound. SPGA is responsible for the 32 other miles in a wonderful system of trails that crisscross the Giant’s body and create almost endless hiking options. My first time on the crew, we hiked up the Green trail to the White and immediately found a huge, beautiful oak tree sprawled across the trail. It took more than one session to cut it apart and toss the pieces on either side of the trail. I experienced both great sadness and a sense of accomplishment at removing the obstacle. At the end of my second week I fell near a tangle of downed trees and sprained my right (dominant) wrist, which kept me out of commission for a few weeks. When I went back we found a huge white pine lying lengthwise in the trail, and had to cut it all up. It’s amazing the difference between sawing a pine (softwood) and an oak or other hardwood, which is so much denser. Just as we finished, a swarm of bees we’d disturbed went on a stinging rampage and three of us got several stings each. The only one spared was our teammate, Melody, who is allergic to bee stings. She was prepared with her epi pen and her benadryl, but fortunately didn’t need either. About three weeks ago we transitioned from starting at the back side to starting at the front side, which is encouraging because it shows how much progress we’ve made (though it’s hard to say how much, since some parts we haven’t reached yet could be filled with blowdowns). Today we seemed to have almost more volunteers than we could use, as we kept running into each other and leapfrogging down the trails as each team found a tree to work on. Every single person I’ve interacted with has been delightful, as team members joke around and constantly appreciate each other’s efforts. Today I got my official SGPA Volunteer neon orange cap and t-shirt. I will wear them proudly. You can read brief interviews here I did for Hartford Magazine with half a dozen folks about why they joined the trail crew. When you fight and fight against “the system” and consistently feel frozen out, it’s hard to keep going, to keep organizing, to keep reaching out to bring in more neighbors, more people who would agree with you if they understood what the struggle is about, to maintain your own equilibrium and your sense of humor. But then once in a while you win – or at least you slow the bastards down, which can provide organizing time and breathing room toward an eventual win. In the past few weeks FERC – the Federal Energy Regulatory Commission – voted to put the brakes on two of the biggest and most passionately contested fracked gas pipelines currently under construction – the 600-mile Atlantic Coast pipeline from West Virginia through Virginia and North Carolina, and the 300-mile Mountain Valley pipeline, from West Virginia to Virginia. FERC responded to pipeline critics’ courtroom successes regarding forest crossings, water crossings, eminent domain and endangered species. Having spent time in West Virginia reporting on another filthy and dangerous fossil fuel extraction process – mountaintop removal coal mining – I really fear for the safety and quality of life of my friends who live in the Mountain State if the pipeline – through steep inclines and unstable rock formations – is allowed to proceed. It doesn’t mean the pipelines won’t be finished, but these decisions are giving people hope. Another thing that’s giving us hope is that a federal judge just ruled that the Trump administration must conduct an environmental review of the new proposed route of the Keystone XL pipeline through Nebraska. Last November the Nebraska public service commission approved TransCanada’s application to build the pipeline, but significantly changed the route. This could delay construction of the pipeline a year or more, making almost a decade since the thing was first proposed. You can listen/read an interview I did right after last fall’s decision with one of the leading ranchers opposing the pipeline, working in beautiful collaboration with indigenous activists and environmentalists. But there’s always plenty of bad news, too. The folks I wrote about last month fighting the Bayou Bridge pipeline in Louisiana are facing increasing oppression. A new state law that just went into effect led to three water protectors being scooped up from their canoes while on public waters. They were arrested and charged with felonies. You can listen to/read my interview with Anne White Hat about that. And Ellen Gerhart (pictured at top), a retired special ed teacher and grandmother, was thrown in the slammer for two to six months, found guilty by a judge of indirect criminal contempt that included baiting a bear to come onto the pipeline route on her property as a means of delaying construction. 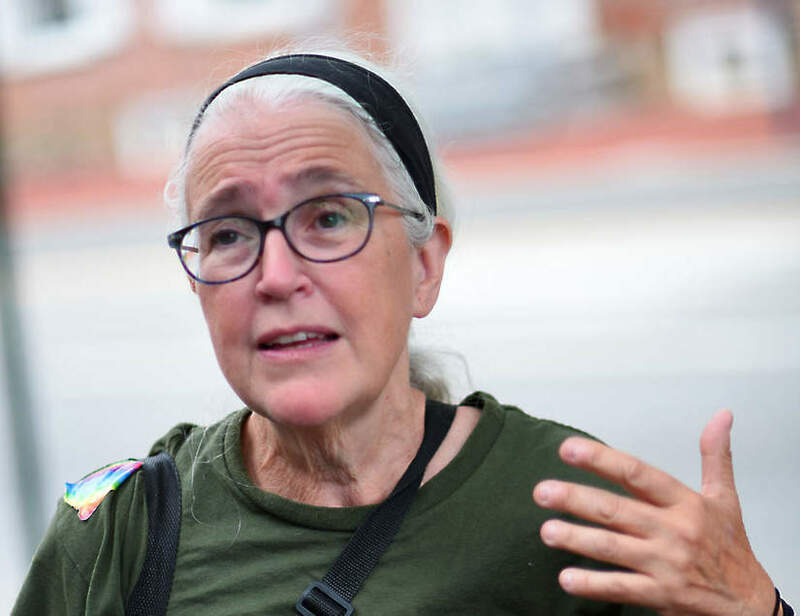 It’s pretty unbelievable that a judge would rule this way, considering the Gerharts live in the woods and have very consciously protected the flora and fauna on their land – so of course it’s not surprising that bears would be about. 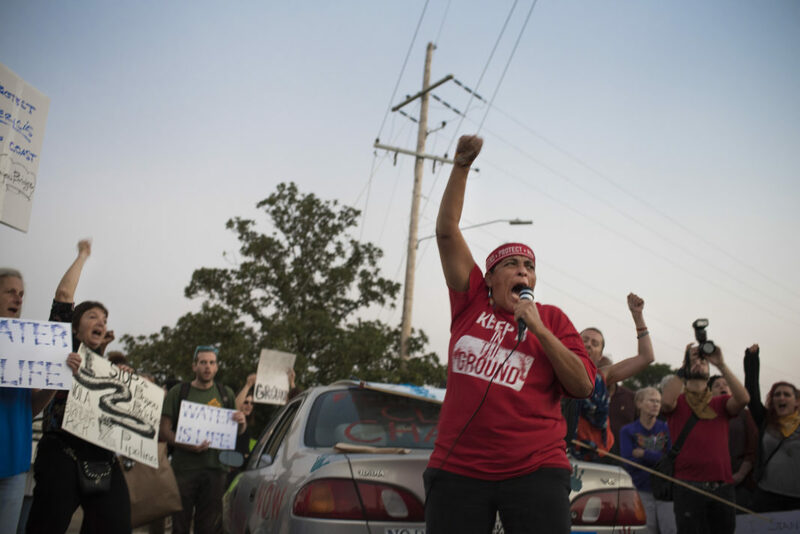 The common denominator in these two cases of intimidation and oppression is that both pipelines are being built by Energy Transfer Partners – the same company that pushed through the Dakota Access Pipeline. Both state actors (judges, police) and private security (like Tiger Swan) work hand in glove with fossil fuel companies to bring about these results. Click here for a damning video of "security" taking down Cherri Foytlin in Louisiana.